Toronto, 19 February 2019 – The Pneumatic Watermelon Squisher, a robotic high-fiver and a coffee drone are just some of the clever and wacky inventions coming to Family Channel this March in the new series Bajillionaires. Debuting as a two-day television event on Saturday, March 2 and Sunday, March 3 at 10 a.m. ET/PT, the live-action comedy follows a group of neighbourhood pals as they try to invent an amazing product, change the world and maybe even make a bajillion dollars in the process! The premiere weekend kicks off Family Channel’s massive March schedule, an incredible lineup complete with returning fan-favourites, must-see movies and brand new shows. Fans who can’t wait to get inventive can check out the Bajillionaires YouTube channel for exclusive video content including fun experiments with the cast, and stream the first episode on the Family Channel App beginning March 1. Twelve-year-old Max Graham is President and CEO of a tiny start-up company that he runs with his friends out of his parents’ garage. The gang is constantly brainstorming ideas for new inventions, and while most of their ideas are hilariously bad, totally weird and completely impossible, they’re always learning something new, becoming better friends and getting one step closer to their BIG idea. In the premiere episode, the gang build a delivery drone, vibrating headband and super juicer to try to qualify for InventiveCon – an invention convention with a big cash prize. Following the premiere weekend, new episodes of Bajillionaires will air Sundays at 10 a.m. ET/PT and will be offered on the Family Channel App and Family OnDemand. 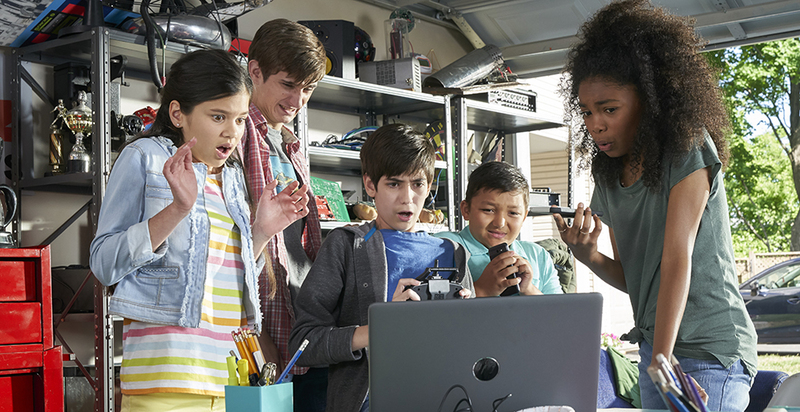 The creativity continues on the Bajillionaires YouTube Channel where young entrepreneurs can check out behind-the-scenes videos, learn how to conduct awesome science experiments, play fun games with the cast and so much more! For more information about the series and its characters, fans can follow Bajillionaires on social media: Facebook.com/bajillionairestv, Twitter: @Bajillions and Instagram: @Bajillionaires. Bajillionaires stars Ricky Ortiz as Max Graham (Unspeakable); Arista Arhin (Star Trek: Discovery) as Alicia Windsor; Mya Singh (Odd Squad) as Kaylyn French; Alec Dahmer as Noodles; Jadian Toros as Zeke; Adrianna Di Liello (Backstage) as Max’s older sister, Chelsea; Sandy Jobin-Bevans (Harold and Kumar Go to White Castle) as Max’s dad, Bryan; and Allison Price (The New Yorker Presents) as Max’s mom, Helen. Bajillionaires is produced by Six Eleven Media in association with Family Channel, created by Derek Harvie and executive produced by Charles Bishop with his team at Six Eleven Media. DHX Media handles international distribution rights. In addition to Bajillionaires, Family’s March schedule is jam-packed with can’t-miss programming for the entire family including: the mid-season premiere of the popular tween drama The Next Step on Saturday, March 2 at 2:30 p.m. ET/PT; the outrageous new game show Beat the Clock debuting Saturday, March 9 at 4:30 p.m. ET/PT; the return of the reality competition series American Ninja Warrior Junior on Monday, March 11 at 8 p.m. ET/PT; popular movie titles like Ice Age: Collision Course, Cloudy with a Chance of Meatballs 2, Hotel Transylvania and Megamind, and new episodes from fan-favourite series Holly Hobbie, Wipeout and Miraculous: Tales of Ladybug & Cat Noir airing all month-long.